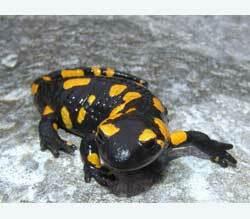 Origin: Fire salamanders are found in Europe, Northern Africa and in some countries of the Middle East. These beautiful salamanders are usually black with bright yellow or orange stripes or spots. The pattern varies depending upon the region of origin. The common name is derived, not from the beautiful color of these animals, but from the fact that they would sometimes crawl out of logs after being tossed into a fire. Fire salamanders are one of the easier amphibian species to maintain in captivity. One to two fire salamanders may be kept in a 10 gallon aquarium. They can be set up in either a naturalistic vivarium, or a more simple enclosure with paper toweling as a substrate. If the towels become soiled, they are readily removed and replaced with clean toweling. If a more naturalistic substrate is desired, peat moss, coconut coir, and large grade gravel makes good candidates. This type of substrate should be replaced approximately once every three weeks to ensure the cage is not harboring dangerous pathogens. The most important thing to consider when maintaining fire salamanders is temperature. Temperatures should range in the high 60s to mid 70s during the active season, and lower during the winter cooling period. As higher temperatures can result in a stressed captive, it is important to keep these animals below 80 degrees Fahrenheit at all times. Crickets make a good staple diet for fire salamanders. The diet can also be supplemented with small mealworms, waxworms, earthworms or silk moth larvae. These salamanders will also feed on pinkie mice, though this should be restricted to once per month, as these animals have a propensity to become obese. If their captive needs are properly met, fire salamanders can live up to 50 years in captivity. The hardiness of this species makes it an excellent candidate for a beginner salamander.